I subscribe to the Windows Secrets newsletter. Recently they had an article on TrueCrypt. I'm not ready to take a position on that fiasco but Susan Bradley had a quote that got me thinking. The TrueCrypt saga highlights the importance of having a Plan B for all our important computing services. This reminded me of a discussion at FedEx when we were moving our data center. As I was discussing this with our Vice President he asked about our "Plan B." I told him I had plans all the way down to "Plan Z." An example was that when we backed up the systems for the move, we made 2 sets of backups. Then when we transported them across town we used 2 completely different routes. At FedEx we learned to have primary, secondary, and tertiary plans. When loading an airplane 1) run weights and balances, 2) put ballast in the front of the plane, and 3) tie the nose wheel to the ground. And always have a backup plane, e.g. "Plan Z." ...we have full replication between the two data centers at the disk array level, should we still be making tape backups for off-site storage? What do you think my answer to him was? We learned the answer at FedEx: primary, secondary, tertiary. And remember my backup solutions? Plan B isn't good enough. You know the old saying in real estate, the most 3 important things in real estate are Location, Location, Location. 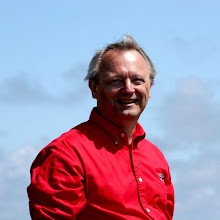 Similarly in IT systems the 3 most important things are Boundaries, Boundaries, Boundaries. Every boundary is an opportunity and not a good kind of opportunity. This was brought home to me in Brian Krebs' recent post on Complexity as the Enemy of Security. Brian was discussing security and how complexity contributed to security exposures. This maxim is true in many areas of IT. Recently I was discussing with a VP of a transportation firm on how to horizontally expand application servers for an existing application. He wanted to put an additional box in front of the application servers. I discouraged that because it added an additional boundary to the system. My suggestion was to do "outside in" routing at the remote clients and not introduce that additional boundary. I used this methodology at a large forest products corporation to consolidate database and application server instances into a large server. While the instances still had their separate identities they were all contained in a single physical box. It made a tremendous improvement in availability. I explored this phenomenon with the CFO relating how the old mainframe systems were easier to support because they used point-to-point circuits instead of TCP/IP networks. She hadn't considered this. It is incumbent on IT professionals to make sure that executives understand the downside of complexity. At an international package delivery company we used this methodology to maintain extraordinary high availability. The mathematics of availability show that compounding 99% availability loses 1% for each additional boundary. And boundaries aren't just physical. This maxim can be applied to changes in status of a system. Every time a system changes status there is an opportunity for it to fail. Simply put, if you don't reboot a server you won't suffer a restart problem. While a single monolithic system won't meet today's demands, every boundary should be closely examined to determine if it can be eliminated. Ok, so I'm OCD. But still some of the details I keep up with are interesting (to me at least). I've been tracking my Internet bandwidth since mid-2011. The stacked bars are Comcast cable bandwidth. The yellow line is AT&T wireless bandwidth (scale is on right axis). The units are KB so 100,000 represents 100GB. The blue is the difference in what Comcast reports versus what my router reports. I switched from AT&T DSL to Comcast in July 2013. I started using CrashPlan for backups in January 2014. I pretty much don't stream video other than an occasional YouTube. No Netflix or Hulu. I attribute the change in May 2014 to uploading and downloading home videos. That's probably worth a post in itself. Stay tuned. The jump in wireless bandwidth in March and April is tethering while I was traveling. As expected my bandwidth usage (and yours) continues to climb at over 40% per year. Comcast does a pretty good job of measuring it. I can already see Comcast's bandwidth cap of 300GB looming in my future. I love my AT&T MobilShare Value 10GB plan with tethering. All I want to do is to be able to use Google Contacts groups in the Gmail app on my wife's iPhone. That seems so straightforward. But you gotta remember that Steve Jobs was involved. I searched and researched. What I came up with was a couple of apps from Playa Apps - Contacts Sync for Google Gmail with Auto Sync and A2Z Contacts. They both have really good ratings and reviews and only cost 99¢ each. 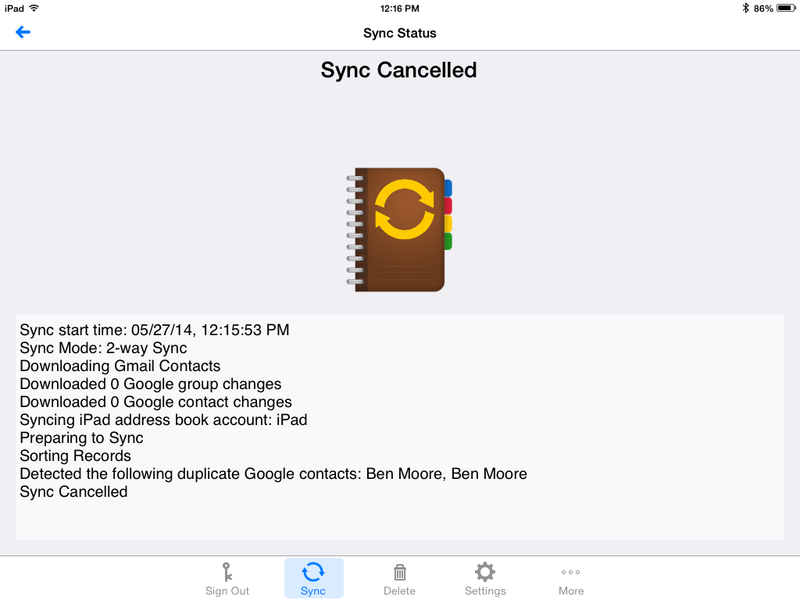 I'm using the Google Gmail app on my iPad and have the contacts syncing with CardDAV. It all works perfectly. No thanks to Google for killing the Exchange ActiveSync interface. It wasn't obvious what I had to do to that configuration to coexist with Contacts Sync so I wrote an e-mail to Playa App's support. Then I tried to send an e-mail to one of those groups using the Gmail iOS app and couldn't find how to do that. I then came across "A2Z Contacts - Contact Manager." Again it wasn't obvious if it would let me send e-mail to groups using the Gmail iOS app or did it have its own mail interface? 99¢ later I had the installed A2Z Contacts and the user guide inside the app explained it allows you to send group emails from it's own interface and it also allows you to create "email lists" to send group emails directly from the Mail app or the Gmail app. So off I went to exercise it. 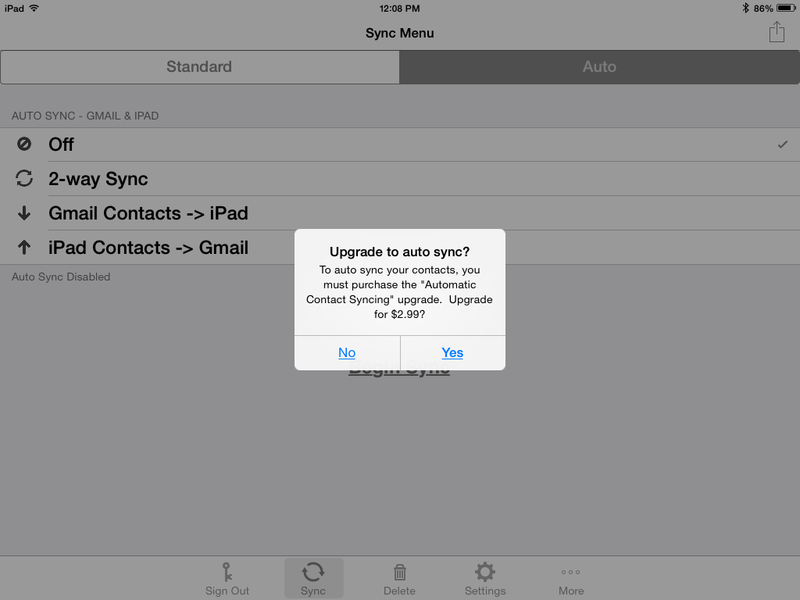 First, on the iTunes page for "Contacts Sync for Google Gmail with Auto Sync" it says "SYNCS AUTOMATICALLY!" Maybe I should have known this but the iTunes section on In-App purchases wasn't clear. 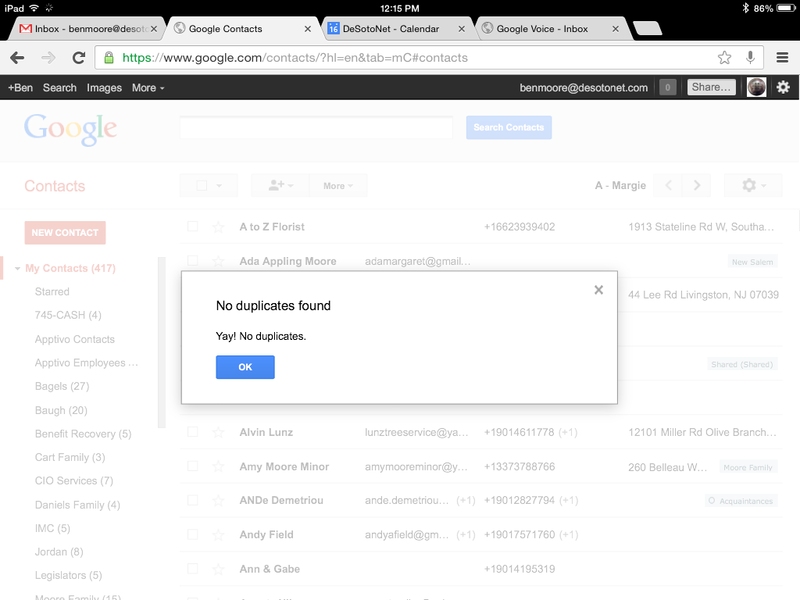 The user guide cautions to ensure that there aren't duplicate contacts in Google Contacts so I checked that. 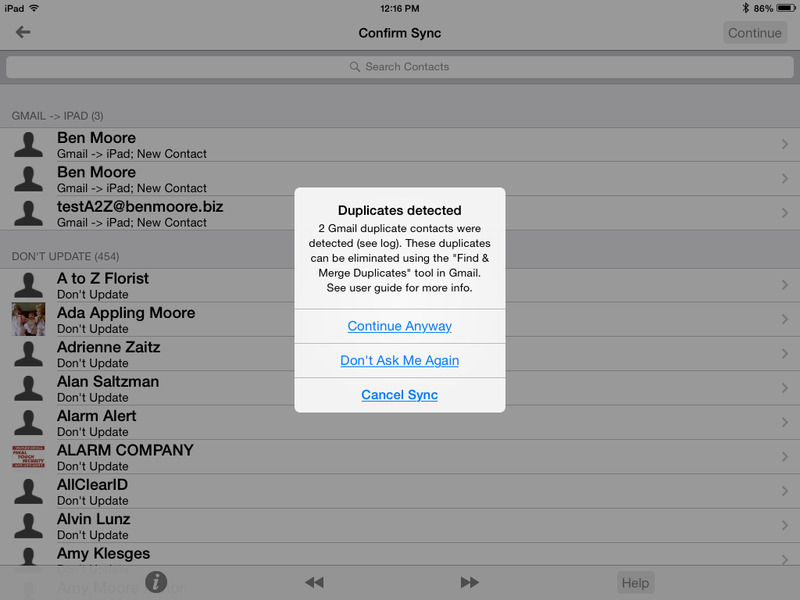 But "Contacts Sync" thinks differently. And the referenced log didn't help me resolve this. 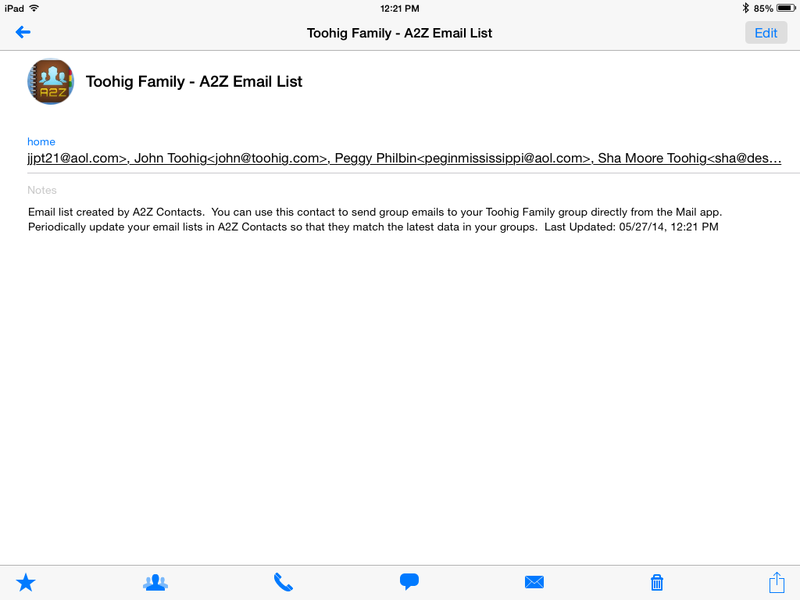 "Periodically update your e-mail lists in A2Z Contacts so that they match the latest data in your groups." I'm trying to do this so my wife can send e-mails to a group that she maintains in web Gmail. There are just too many manual steps in this process. I don't fault the developer of these apps at all. He has been prompt and helpful in his responses. I realize the limitations that Apple puts on developers. The only alternative I see is for me to manually create the same type of "e-mail list" on the web Gmail and let her use it from her iPhone Gmail app.